The British are known for being a nation of pet lovers – but few of us consider who will take care of them and how they will be provided for after we die. There are a number of options for your pets, whether or not you have close family and friends who are willing to take them on should anything happen to you. But whichever option suits you best, you can only ensure it is carried out by making a clear and binding will, and informing your loved ones of your wishes in advance. You may have assumed that your nearest and dearest will take care of your pet after you have gone, but when asked, almost a quarter of those faced with inheriting a pet said they would choose to give it away or have it put down! So make sure that you talk to those closest to you before assuming they will be happy to look after your pet. And to ensure they have all the information they need about your pet’s diet, medical needs and preferences, you can include all this information in your will. Saga has published an excellent ‘Pets Left Behind’ Executor Form that can help you outline all the information you might need to pass on. Sometimes loved ones may be willing to inherit a pet in principle, but are put off by the costs. Vet bills and food bills can soon mount up, especially as a pet gets older! But similarly to how you might provide for a person in your care, you can set up a trust to provide for your pet after you have gone. You can appoint the new owner of your pet as trustee, so they can access money for specific costs such as vet visits, pet insurance, food and grooming. 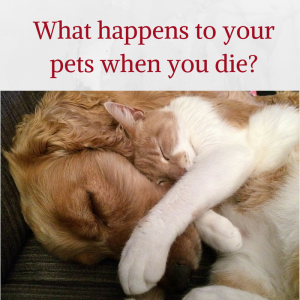 You can also make provision for who the remainder of the trust will pass too, after your pet has died. A trust (rather than a simple bequest) can also protect the new owner from losing benefits when they gain the money to provide for your pet. For example, if you leave your pet to elderly parents or other relatives who may need Carers’ Allowance by the time they come to inherit, a trust could protect them. And please remember that although you can specify a trust be spent on the care of your pet, you cannot leave the money to the pet itself! You should also consider setting up a Lasting Power of Attorney so that – in addition to other considerations – your pets can be looked after and their care paid for should you become ill to the point that you are unable to make, or voice decisions. What if there’s no-one to look after your pet? If you don’t have a specific person that you’d like to entrust your pet to after your death – or if you want to put an alternative plan in place in the case that you outlive the person you have named as your pet’s new owner – many charities including The Cats’ Protection League, The Dogs Trust and the RSPCA have schemes in place to care for or rehome your pet in the event of your death. All these charities strongly recommend that you include your wish for them to take responsibility for your pet in your will or estate plan. The RSPCA even provide a draft clause that you may wish to include in your will (or add as a codicil)! So don’t assume that because you don’t have a big estate, lots of money or a complicated family that you don’t need a will. With the right advice, you can plan for all the loved ones in your life – including the four legged ones! If you’d like to book a free consultation with one of our legal experts, book online or call 01342 477 102 and quote ‘Providing for Pets‘.